HAVANA — Dinner for two: $5. Cigarettes: 85 cents a pack. Beer for a buck. Daiquiri or mojito: $2.50. Sounds of “Guantanamera” filling the cobblestone streets, all packed with classic Detroit cars and salsa dancing: free. Everyone smiles in Cuba. They sing. They dance. They have an irrepressible rhythm, syncopation, a beat. There’s music all day and night. To understand it — to get into it — you must go. Travel to Cuba has been a mesmerizing dream that became reality when former President Barack Obama relaxed the U.S. embargo grip on its nearest non-contiguous international neighbor. The opportunity for a random trip to a forbidden never-neverland finally was within reach. Hearing rumors that this “Havana Spring” reflecting a U.S./Cuban détente might soon evaporate in the June Caribbean sun, we made a leap at the opportunity to go. The reason, permitted by State Department regulations, was journalism. Armed with credentials from the American Federation of Musicians Local 5 to write and photograph a story about street music in Cuba, we took off for Havana. We hopped a Delta flight from Detroit, and with no complications except the tedious reprint of the Cuban Visa, found ourselves on the streets of Old Havana a little more than five hours after departure. It’s easy to get there. The flight from is pleasant. People are brimming with excitement onboard, chatting mostly about rum, cigars and the legendary exploits of Ernest Hemingway. Several people aboard appeared to be latent reincarnations of Papa Ernest. We sat across from a well-known former Detroiter, Felix Sharpe, who was a political policy wonk for Wayne County Executive Ed McNamara and governors Jennifer Granholm and Rick Snyder. I knew him from the McNamara days. He is Cuban. He owns property in Havana and promotes business, cultural, tourist and social engagement. Felix proved to be a warehouse of Havana lore, giving tips on eateries, attractions, and even providing us with a driver who owned a 1950 Chevrolet with a new Mercedes engine. Felix gave us the best advice about our first foray: Things in Cuba are slow. Expect delays. Expect minor disappointment with the quality of the food. And expect good music, great views and the nicest people you’ll ever meet. Anywhere. Landing at Jose Marti International Airport in Havana sets the perspective properly: there is no island in the Caribbean that looks this way. Cuba rises above the Gulf of Mexico in a surreal tropical haze. You clear customs, immigration and a routine security search quickly and it is off to your first contact with this neighbor that President Trump accuses of perpetual human rights violations. That first contact is a cacophony of cars of all makes and sizes, circa 1950. The second contact is with the Americanization of these vehicles. Nearly every taxi for hire had an American flag or a sketch of Ben Franklin tattooed on the back window. Cuba is open for business. Five minutes outside of the airport, we were convinced that this was the most capitalist of any communist country. Cubans are energized by friendship and support. Everyone looks for an angle to supplement their government-mandated monthly wage. Americans have provided much of the answer. From the moment we cleared the landing ritual, the significance of the Obama-induced reforms was reiterated hundreds of times by the artists, dancers, performers, writers and wait-staff all throughout Havana. It is a nation that is color-blind and service-oriented. We never felt unsafe. Never threatened. Never wary of speaking frankly with ones we met. If there was a military presence in Cuba, it wasn’t evident. If there were police, they were friendly, courteous, willing to speak and accommodate. Tourists are treated like honorary Cubans in Havana. And so our adventure led us to the streets, where music and dance live 24 hours a day. There is a sampling of all sorts of Cuban, Spanish, African, Salsa, Rumba and Mambo music. It’s the Buena Vista Social Club for real, often supplemented with the Eagles, Nat King Cole, the Beatles and Sam Cooke. 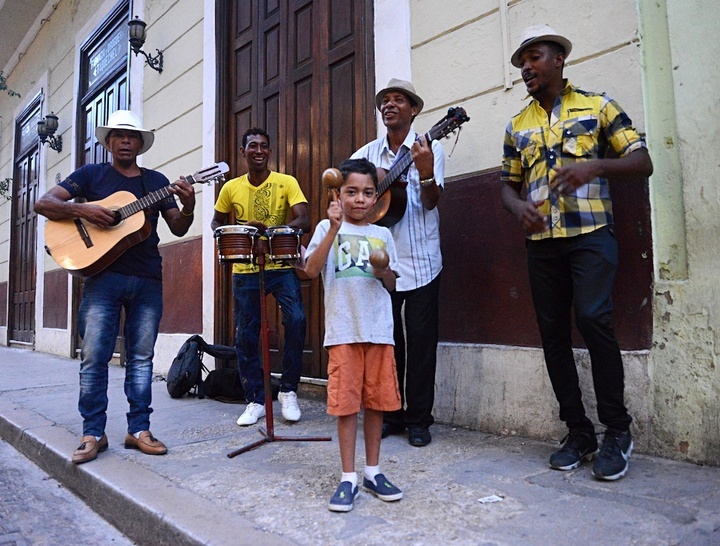 New instruments, ancient folk implements, traditional percussion, trumpets and the classic Cuban tres guitar, echo throughout the streets and alleys of old Havana, competing only with each other and the persistent jackhammer that carves out its own rhythm. This rhythm propounds the restoration and stabilization of centuries-old hotels, residences, museums, government offices and churches. Churches? Yes. Religion is permitted prominently in Cuba. It seems at times that there is a church on every corner. And if not a church, then a restaurant or bar. It is in front of those restaurants and bars those musicians and dancers congregate. Most come to play after finishing their government-funded day job, a situation shared by struggling musicians worldwide. They perform and interact with the audience, both passive diners and active walkers. The availability of free, unregulated entertainment transformed Cuba’s underground economy into a major enterprise. Baloy Guerra, a chemist by daytime, is the lead singer for Legendaria Habana, a band of four or five musicians who perform nightly in front of La Luz restaurant on Calle Obispo next to the historic Papa Ernest haunt, Hotel Ambos Mundos. The band improves his lifestyle tremendously, with each musician picking up an extra 5-20 CUC (Cuban Convertible Pesos) per night. Thirty dollars on a good day. The band interacts with the audience like in a Las Vegas showroom. Dancers merge, pass on the streets and put on their own show to the beat of the band. “Americans are big tippers,” Baloy says. He adds that the waiters, the bartenders and the staff all benefit from the music and the engaged audience spilling into the street. Musicians and restaurant personnel we spoke with feared the drop in tourism, days before the Trump proclamation last week that restricted visitors and U.S. dollars, setting the warmed relations between two neighbors back to the Cold War. Bands like Baloy’s treat music as the international language and it was not uncommon to find American musicians joining their Cuban counterparts in song and performance. The aggregate spending of a couple for an evening in Old Havana, at a modest venue with music and several beverages to ward off the heat, could reach as high as forty dollars. Best of all, it provides much more than money. It creates good will, friendship, diplomacy and a reason to come back.